Teachers will learn ways to help students make connections, investigate phenomenon, describe observations and inferences, prepare and present models, and compare how conclusions measure up to benchmarks in the Standards. The goal of the 5E framework is not to teach students facts and not to measure success by laboratory or engineering perfection. The goal is to empower budding scientists and allow them to explore the world, ask meaningful questions about natural phenomenon, and choose the best science and engineering practices to understand and explain their experience. 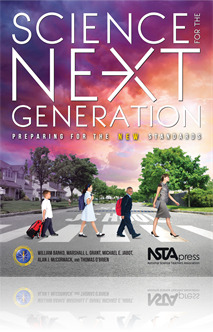 This guide provides an argument and a framework for teaching the Next Generation Science Standards and is a necessary resource for any K–5 teacher or administrator who is responsible for bringing the Next Generation Science Standards into the classroom.